Reprint. Originally published: London: Macmillan Children's, 2008. All the birds have eggs to hatch. All except Duck. When Duck finds an egg of his own to look after he's delighted: it's the most beautiful egg in the whole world! But all the other birds think it's a very odd egg indeed - and everyone's in for a big surprise when it finally hatches. 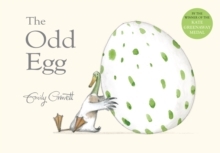 With lots of split pages that allow the visual jokes to unfold, The Odd Egg is another witty and lively book from award-winning creator, Emily Gravett. A beautifully illustrated and cleverly formatted tale with a surprise ending that's bound to ruffle some feathers!